After one full growing season, our trees should have reached between 20cm and 1m in height depending on our feeding, weeding and watering. They are now ready to be dug up and transplanted, either to their final home or for another year of growth before being planted out. 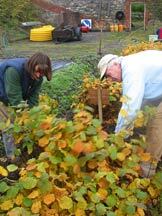 Once the leaves have turned colour in the autumn, usually around the end of October, we can begin to dig up our trees. Great care must be taken to prevent damage to both the stems and the roots whilst they are being moved. Excessive drying of the roots must be avoided at all costs. 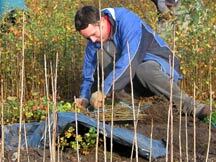 Using a garden spade or fork, carefully ease the trees out of the ground. Do not insert the spade too close to the roots as it may cause damage. Only pull the trees gently – they musn’t be forced out – after the soil has been sufficiently loosened. The trees should be separated into different sizes if they are destined to be transplanted for a further year. This means that the taller trees won’t be overshadowing the smaller trees. Use bags to store the trees temporarily and to keep their roots away from the sun or drying winds – it may only take a few minutes before any drying becomes damaging. For short-term storage plastic bags are fine. Tie them at the top to seal in moisture and the trees will be okay for a few days. If you need to store them for any longer, they should be ‘heeled-in’. This means simply covering the roots with soil or sand to keep them moist, using your heel to gently firm them in. Trees can be kept like this until they begin to grow again! Those trees that are too small to plant into their final home will need another year of growing. 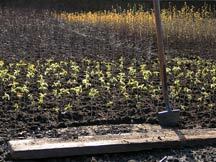 They can be transplanted to give them more space (about 10-15cm between plants). Standing on a board to prevent soil compaction, make a v-shape by inserting a sharp spade to its full depth and pushing it forward slightly. This allows the roots of the tree to fit between the back of the spade blade and the soil. Make sure the roots are pointing downwards and outwards. 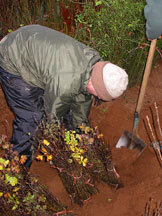 Remove the spade and firm with the foot, ensuring the tree is upright and at the same depth as it was growing before. If you need to repot your containers, this is best carried out during the late-autumn or early-spring. Part-fill a larger container with a small amount of compost. Remove the tree gently from its old pot (tapping the pot at its edge might help loosen it) and sit the rootball on top of the compost in the new pot. Fill in around the edges with fresh compost, ensuring the tree is at the same depth as previously. Firm with the fingers, water well and feed regularly throughout the growing season.